The long story: Some of my colleagues in chemistry have recently started using Numbas, and one of the first things they wanted to do was ask students to specify units along with their answers. In the sciences, using the correct units is very important, while in pure maths we rarely trouble with such things. Numbas has no built-in understanding of units, so we needed to add it in: working with units hadn’t been a priority for me until now, since most use of Numbas in Newcastle outside the main maths degree has been for stage 1 service courses or for statistics. 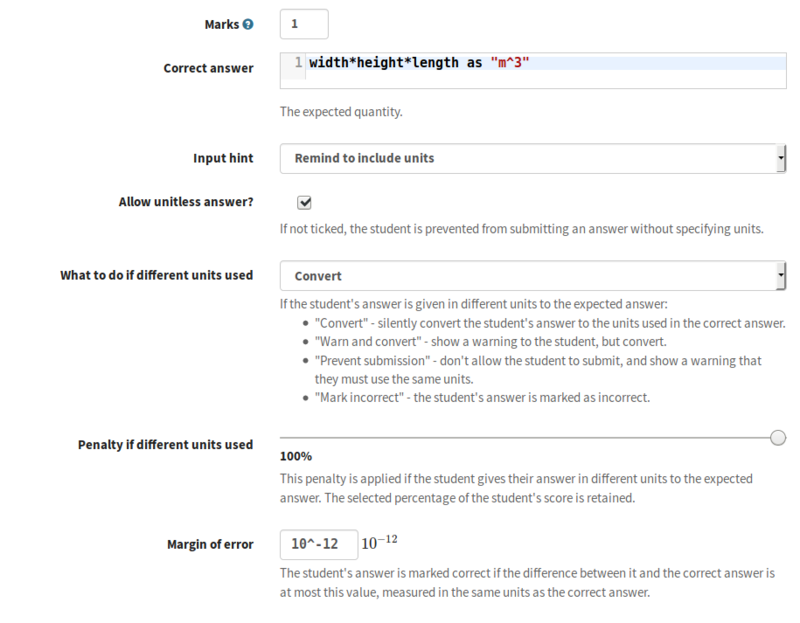 The “quantity with units” part type has several options, including the style of hint to show, and how to handle units that are different from those used in the expected answer. The student enters their answer in a standard text box. 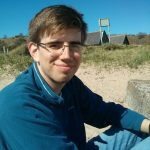 The part will reject a quantity in incompatible units, and can optionally convert or reject units compatible with, but not exactly the same as, the expected answer. You can tell the student which units to use, automatically detected from the correct answer. The extension integrates completely with Numbas: you can use quantities like any other JME variable, so arithmetic, sorting, and substitution into question text or LaTeX expressions work as you’d expect. The extension handles compound units as a matter of course, and converting to different units is as easy as quantity as "kg/m^3". You can even substitute quantities into SVG diagrams, as demonstrated in the image above. The code and documentation for the extension are on GitHub now, and it’s available to use on the Numbas editor at mathcentre.ac.uk. I’ve prepared a demo exam containing a few questions which demonstrate how to work with quantities, and show off a few of the possibilities. To use the extension, tick the “Quantities” item in the question editor’s Extensions and Scripts tab, and add a “Quantity with units” part by clicking the “More part types” button when you add a new part, then searching for “quantity”. Don’t generate scalars and add on units at the last minute. You really can generate an amount with units, and do arithmetic on it throughout the variable generation process. It’s nice to do something like the volume calculation above and see the right units pop out at the end! The ‘as’ operator makes it easy to convert between units. You could generate a quantity in some base units, then randomly pick the units to show them to the student, or decide between mm, cm and m based on the order of magnitude. It’s very easy to come up with a random length, say, that is the wrong order of magnitude for the units you’ve chosen. 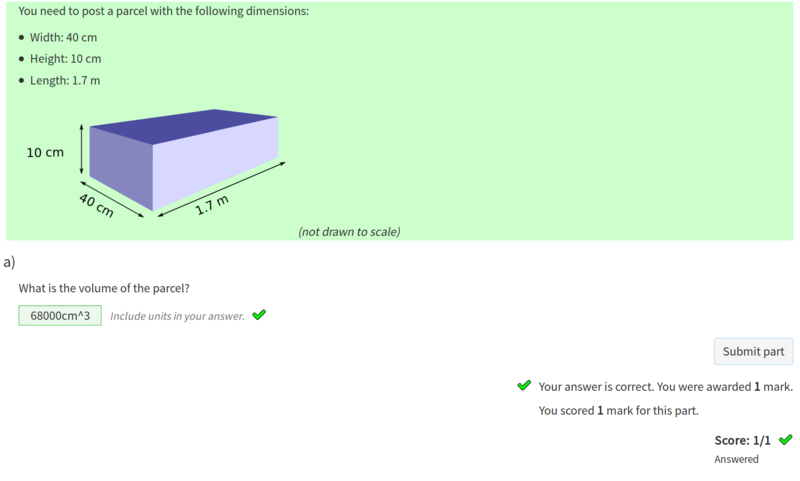 For example, one question produced a measurement of “0.0000001km”. I might add a “sensible_si_unit” function to pick the right units for a given quantity – that needs some thought! I’m excited to see what can be done with this extension: it’s really very straightforward to use, and opens up a new world of topics for Numbas questions.